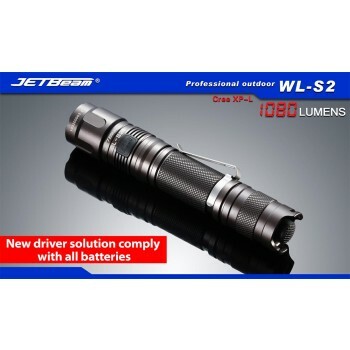 The JetBeam WL-S2 is a full featured LED flashlight with adjustable output levels and strobe functions using two switches (tail and side). Whether hiking, hunting, Search & Rescue, or simply reading, the WL-S2 is a great choice anytime a dependable light is required. The premium CREE XP-L LED, coupled with precision reflector provides up to 1080 lumens of output and reaches out to 280 meters. Switch easily between 5 different levels of output and 2 different strobe modes (tactical strobe and SOS) with the 2 switches (tail switch and side switch). The current power level of the battery is easily seen from the indicator lamp located under the side switch.